So, I don’t know about you but in the winter time I am constantly making hot chocolate almost daily. I have it so much that I have come up with my own little recipes & I love trying new hot chocolate flavors from different companies. It’s become a daily routine for me to have a cup of hot chocolate & I love it! This year I really wanted to create a hot chocolate bar in our house to make making my hot chocolate daily super convenient & to have available when we have company over. 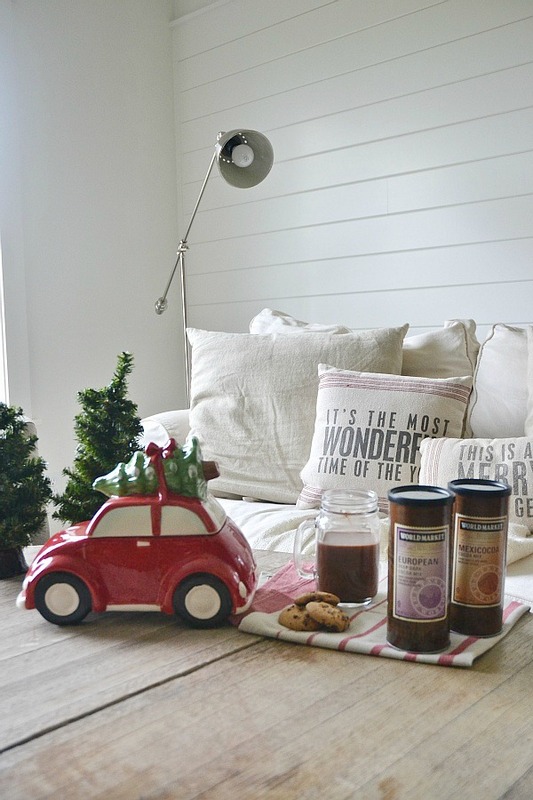 I teamed up with World Market to style my hot chocolate bar & I was super excited because I actually purchase there hot chocolate all the time & I love the variety of different flavors they have. 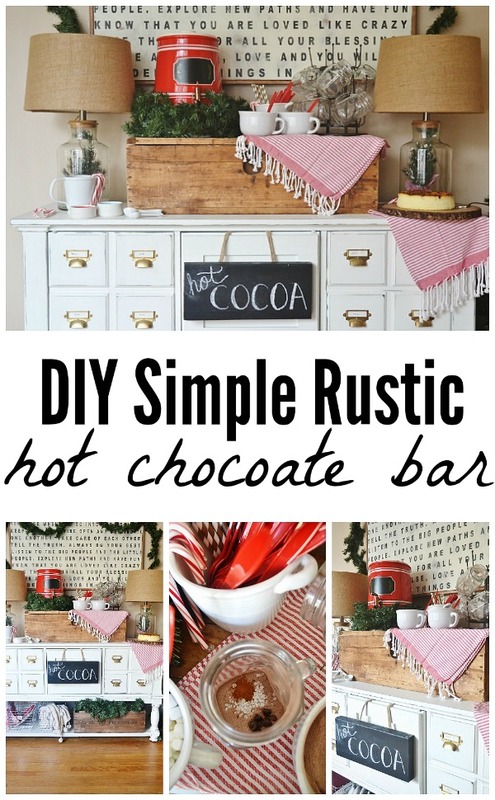 I hope you love my simple rustic hot chocolate bar I put together! 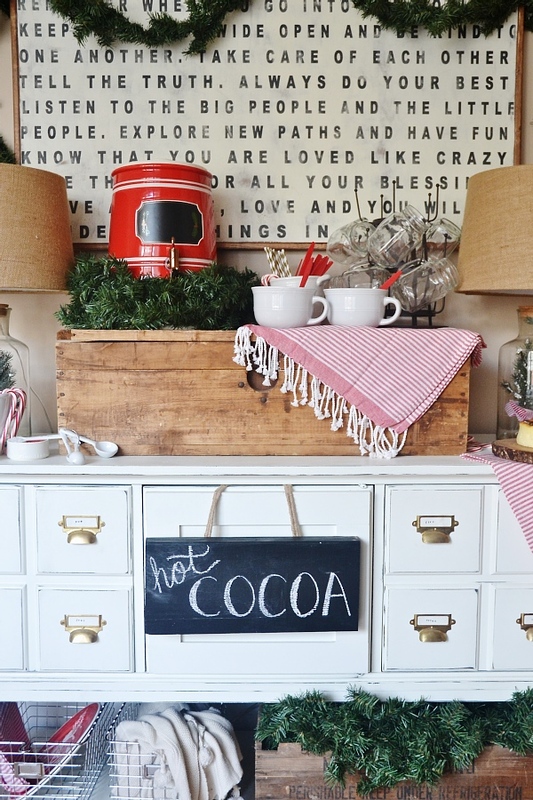 Making a hot cocoa bar is just too simple & too fun! To create this bar I used a piece of furniture that is in a cove off of our kitchen. 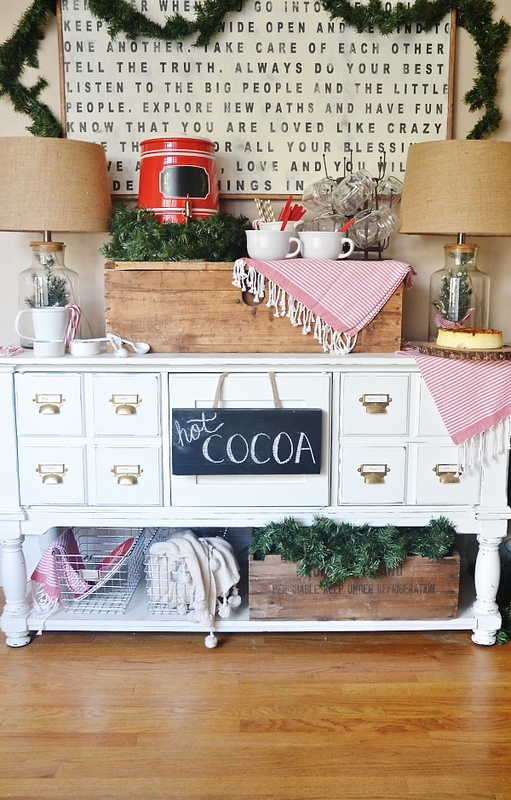 I used a box to add height & to put the cocoa, hot water dispenser, mugs, & utensils on. All of these items or items like it can be found at World Market & you really don’t need me to tell you how awesome the place is because I know we all spend lots of money there already because you can’t walk in & walk out empty handed. 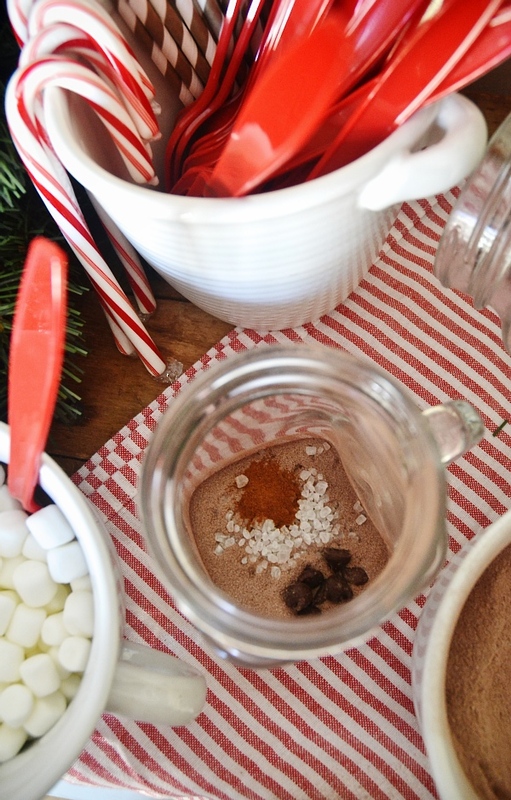 Some essentials for the hot chocolate bar are hot cocoa powder, marshmallows, spoons, straws, cinnamon, salt, mugs, hot water dispenser or something like it to keep the water, & maybe even a dessert to pair with your hot chocolate. Want to amp up your hot chocolate? After buying a million times of buying salted hot chocolates at coffee shops, I decided to try making my own. I don’t have this recipe down to a science, but I mix a pinch of sea salt, a dash of cinnamon, a few dark chocolate chips, hot cocoa, & some hot water. It brings hot chocolate to a whole new level & if you like sweet & salty things I think you will love it too! Again, all these ingredients can be found at World Market because it’s not just home decor, but also yummy food and drinks from around the world. Some of my favorite hot chocolate flavors at the moment are Mexicocoa which is a little spicy & the European dark chocolate which is great when you add a little salt. & the best thing about hot chocolate is that it cures that sweet tooth I seem to get everyday! 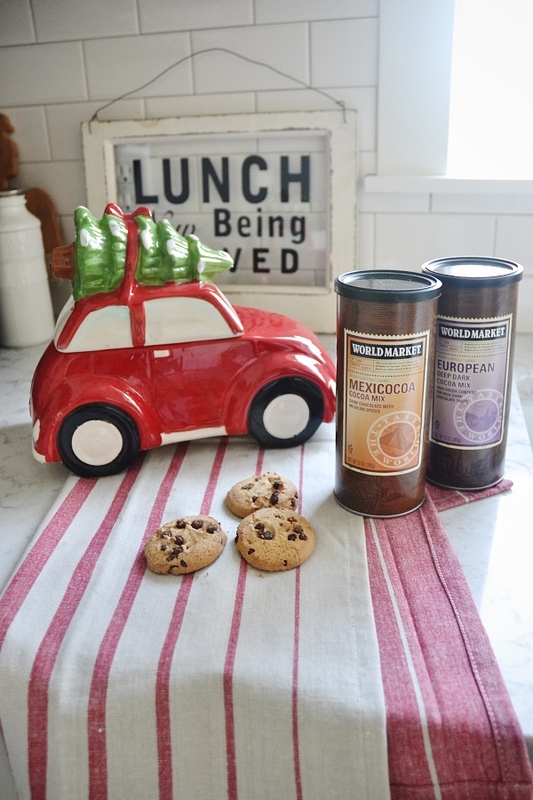 haha & how cute is this car cookie jar we got? It’s my new favorite item in our kitchen! 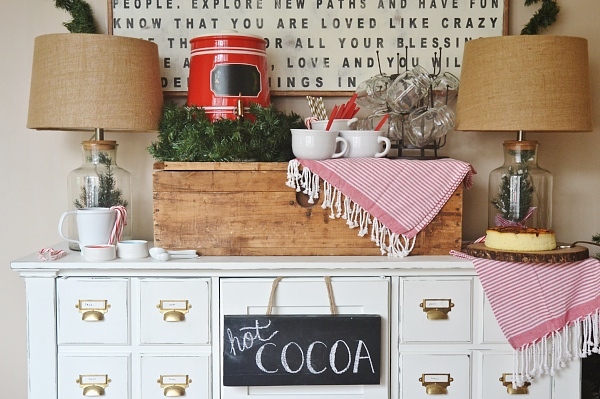 What do your think of my hot chocolate bar? 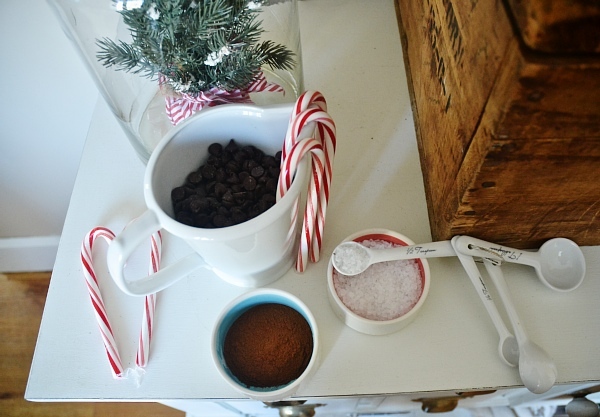 Have you ever tried to make your own salted hot chocolate before? I would love to hear how you make yours!! Seriously.. I want to try new recipes. Leave them below & make sure to let me know what your think of it if you try it! Let me know int he comments below, find me on Instagram, & chat with me on Facebook. 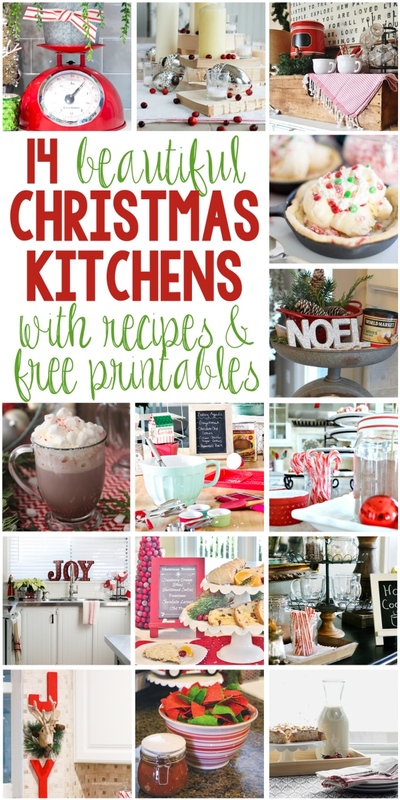 Be sure to visit these other lovely bloggers kitchens for more fun recipes & printables!! I was provided a gift card from world market for this post, but all opinions & statement are honest & you know I would never steer you in the wrong direction. Love you guys! Liz, I love your style! I can not wait until we get to see your new home! The hot chocolate bar is so cool. I attempted to make a hot drink bar this year as well. I thought it might help me to get through our Michigan winter! I also love, love, love World Market! I don’t see the red dispenser on World Market’s site. :-S Where is that from? I’m on my way over for cocoa Liz!! Love everything about this! Aww! This is to cozy looking! 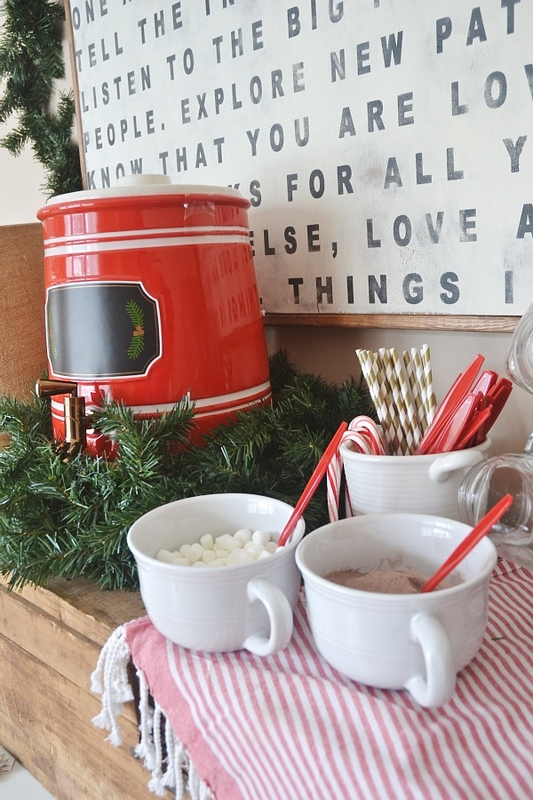 I have been thinking so much of what to do for a Friends Christmas Party this year, and for a week or so I’ve thought of settling on a hot cocoa bar party. And this just sold it! 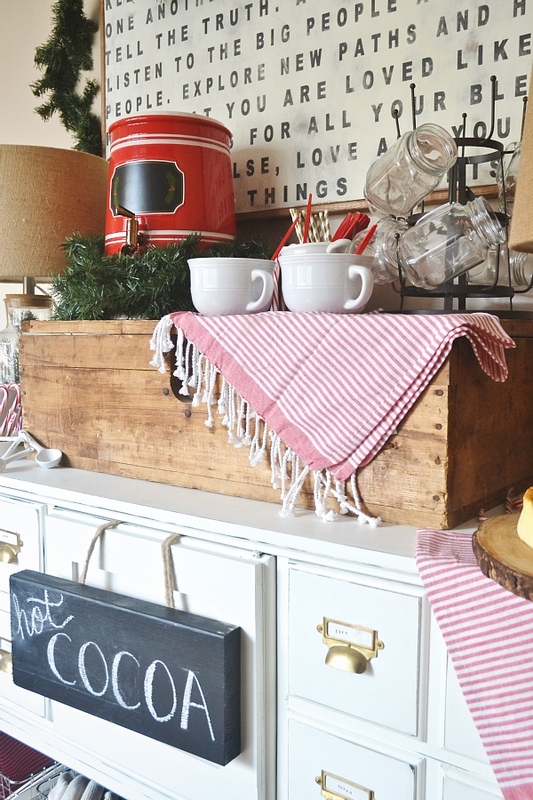 🙂 I also have been thinking of making the hot cocoa bar for simple visitors and You seem to have aced it ^^!!!! I adore it so cute on so many levels! This looks lovely Liz! And I totally agree that you need at least one hot chocolate daily during winter! I’ve never heard of a salted hot chocolate though so I will have to give that a try! Where can I find that red dispenser? I have been looking everywhere for an old fashioned style hot beverage dispenser. 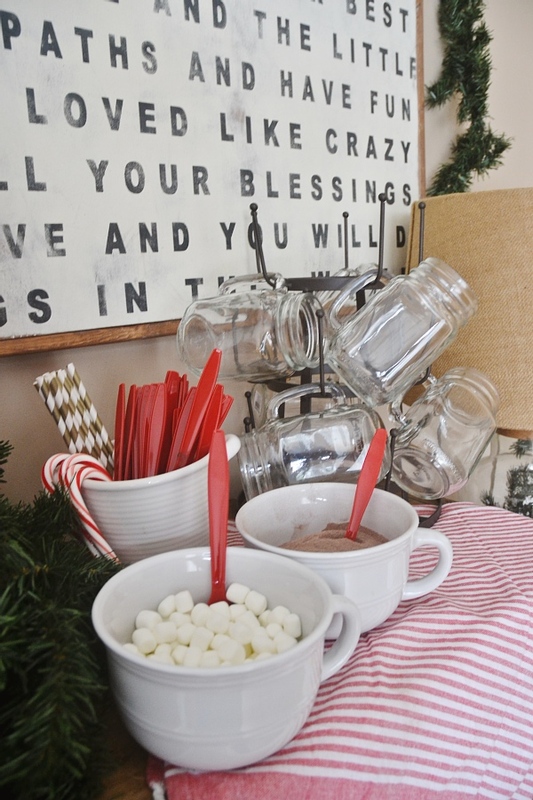 Love the creative way you displayed the hot chocolate bar. Perfect for a holiday party.